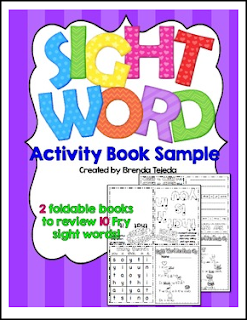 Keep your students excited about learning and practicing their sight words! These mini activity books each have 4 activities to review 5 sight words at a time! The first page has rebus sentences to help students focus on the sight words in that book. There are 3 additional engaging activities for children to practice the words. Your students will LOVE these little books because no two are exactly the same! The variety of activities will keep them engaged and looking forward to doing the next book! Best of all, they can be used independently once children are familiar with the activities. Save paper and ink! 4 activities on 1 piece of paper! Great for morning, center, 'early finisher' work, or as homework. Also great to reinforce sight words in a small group or with a peer helper.